Home / Editor's Choice, Entertainment News, Gossip and Drama, Lifestyle / Revenge is a meal best served cold! See how his ruthless LADY dealt with her cheating boyfriend. Revenge is a meal best served cold! See how his ruthless LADY dealt with her cheating boyfriend. 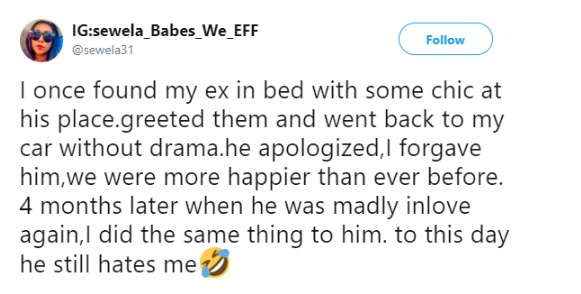 Thursday, April 11, 2019- This Lady has taken to twitter to narrate how she got exerted revenge on her cheating boyfriend. Having caught her boyfriend pants down with another lady, she just walked out like it wasn’t a big deal to her. When the boyfriend begged her for forgiveness, she forgave him. However, she was just buying time and waiting for a perfect opportunity to strike back. She tweeted: "I once found my ex in bed with some chic at his place.greeted them and went back to my car without drama.he apologized,I forgave him,we were more happier than ever before. 4 months later when he was madly in love again, I did the same thing to him. to this day he still hates me?" Well, now you know why they say revenge is a meal best served cold.